Newspaper clipping courtesy of Mark Eastridge. Flair/Hawk photo by Bill Janosik. August of 1974 was highlighted by bitter feuds that Mid-Atlantic fans could hardly believe their eyes as they witnessed the matches. Brutality reigned, as Swede Hanson finally battled his long-time partner Rip Hawk in single matches. And Sonny King was out seeking revenge again the Super Destroyer and Johnny Valentine, the two wrestlers that conspired to put his brother out of commission. While the split between Rip Hawk and Swede Hanson occurred months before, August 1974 was the first month where the two went toe to toe in individual bouts. Swede dominated the action in these encounters, which more often than not saw Rip leave the ring before Swede could catch a pinfall on him. The crowds were huge for these early matches between Hawk and Hanson. For instance, in Greenville, South Carolina on August 12th, Swede defeated Hawk before an overflow sellout crowd of nearly 6,000 at Greenville Memorial Auditorium. The previous week in Greenville, Hanson defeated Hawk in another rugged match before a huge crowd. The Mid-Atlantic fans in Raleigh, North Carolina saw a great trio of matches between Hawk and Hanson during the month of August, which in many ways mirrored the sequence of bouts between these two in other towns around the area. 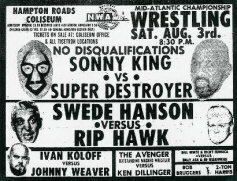 On August 6th, the big Swede beat Rip at the Dorton Arena after Hawk left the ring as Swede was pummeling him unmercifully. This led to a return match the next week in Raleigh, where the stipulation was that if Hawk ran away from the ring again, he would be fined. Finally, the next week at Dorton Arena on August 20th, promoter Joe Murnick made the match between these two a Lumberjack Match! Unable to run, Hawk suffered a loss in quick fashion to the big Swede in the Lumberjack bout. Despite the bulk of the matches between Rip and Swede being one-sided in Swede’s favor during the month of August, the fans nevertheless flocked to these matches, no doubt wanting to see “The Profile” get his comeuppance after many years of using Swede as a shield! Sonny King was busy during the month of August, attempting to extract revenge from the two men who conspired to put his brother, Bearcat Wright, out of action. King had memorable battles in August with both Johnny Valentine and the Super Destroyer. Norfolk, Virginia was the site of two classic bouts between King and Johnny “The Champ” Valentine during the month of August. And both were matches for Valentine’s Mid-Atlantic Heavyweight Championship! The first bout in Norfolk between these two was held at the Scope Exhibition Hall on August 8th. In this match, King controlled the majority of the action, but failed to capture the belt when Johnny got himself intentionally disqualified. In the return bout two weeks later at the Scope Exhibition Hall, Sonny got a stipulation that he desperately wanted…a No Disqualification bout for the Mid-Atlantic Heavyweight Championship! But unfortunately for King, this match got totally out of control, and ended with both men being counted out of the ring, thus allowing Valentine to retain his Title. The matches between King and the Super Destroyer were no less ferocious during the month of August. In August, these two went at it in Hampton, Virginia, Greenville, South Carolina, and Charleston, South Carolina in very memorable contests. But perhaps the town in the Mid-Atlantic area that saw the Super D. and Sonny King at their wildest was Columbia, South Carolina. On August 13th at the Township Auditorium in Columbia, these two beat each other into bloody messes! This led to a rematch in Columbia the next week. The August 20th match saw Sonny dominate much of the action, but when the fray spilled outside the squared circle, the Destroyer got himself disqualified, allowing King to emerge with a hard fought victory. This feud was really starting to get torrid in August! Mid-Atlantic Heavyweight Champion Johnny Valentine continued to have a stranglehold over his belt during August. 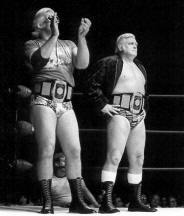 In addition to “The Champ’s” battles with Sonny King during August, young Tiger Conway and popular Paul Jones emerged as viable contenders to Valentine’s Mid-Atlantic Heavyweight Championship. Roanoke, Virginia saw two bloody battles between Jones and Valentine for the Mid-Atlantic belt during the month of August. On August 3rd, the two squared off in a ferocious contest that left the fans breathless. However, the disqualification finish begged for a return match. And that’s exactly what happened two weeks later! The No Disqualification return bout was as exciting as the first encounter, but “The Champ” still emerged with his Title intact. Tiger Conway also gave Valentine all he could handle during the month of August. The youngster from Texas had two memorable Mid-Atlantic Title battles with Johnny Valentine during the month of August. On August 13th at the Dorton Arena, Tiger scored an upset victory over “The Champ.” However, because the win was via disqualification, Johnny maintained hold of his championship belt. This set up a Title rematch in Raleigh on August 20th. While Tiger controlled the action for the most part, Johnny managed to edge out a victory by the skin of his teeth. But everybody in attendance at Dorton Arena knew Tiger was a worthy challenger, and that he was getting better and better. Mid-Atlantic Television Champion “Number One” Paul Jones had an active month in August, but defending his TV Title was not what kept him busy. Between tag team bouts and trying to wrest the Mid-Atlantic Title from Johnny Valentine, Paul did not put a lot of time into defending his TV Title. However, Jones did have an interesting Title match during the month. In Richmond, Virginia on August 23rd, Jones defended his TV Title against Ivan Koloff, in a bout where the stipulation was that if Paul lost, he would throw out 1000 silver dollars to the fans! Paul prevailed in this match, kept his Mid-Atlantic Television Title, and the fans in Richmond went home empty handed! Indian Chief Wahoo McDaniel got into the full swing of things in the Mid-Atlantic area during the month of August. On August 5th in Fayetteville, North Carolina, Wahoo formed what would be a dynamic tandem, teaming with Paul Jones for the first time, battling the villainous team of Ivan Koloff and the Super Destroyer. In August, Wahoo also had his first encounter with the young and brash Ric Flair, batting the talented youngster in a singles match in Columbia, South Carolina. Two of Wahoo’s most impressive outings during the month occurred against Mid-Atlantic Heavyweight Champion, Johnny Valentine. In non-tile bouts, Wahoo beat Valentine cleanly in Greensboro, North Carolina on August 15th, and closed out the month by beating “The Champ” again in Richmond on August 30th. Wahoo was making it very clear in short order, that he was a force to be reckoned with in the Mid-Atlantic area. Mid-Atlantic Tag Team Champions Rip Hawk and Ric Flair wrestled sparingly as a team during the month of August. Hawk had his hands full with his singles battles with Swede Hanson, and Flair was also busy during the month with lots of singles matches with Tiger Conway. Hawk and Flair did have a wild melee of a match with Swede Hanson and Tiger Conway on August 2nd at County Hall in Charleston, South Carolina. In that bout, the referee was forced to disqualify both teams as matters got so out of hand! Rip and Ric also had a noteworthy match in Spartanburg, South Carolina on August 17th against the tandem of Wahoo McDaniel and Tiger Conway. The champs actually dropped this match, but luckily for them, it was a non-title affair. August of 1974 had some of the hottest action that the territory had seen in years, with former long time partners Rip Hawk and Swede Hanson doing battle against each other in singles contests across the area. Add to that Sonny King going after revenge against the Super Destroyer and Ivan Koloff, and you had a recipe for non stop mayhem! And Indian Chief Wahoo McDaniel was just getting started in the area. 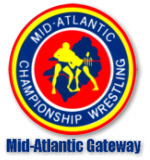 Yes, August of 1974 was a great time to be a fan of Mid-Atlantic Championship Wrestling! 1. Wahoo McDaniel---The big Indian Chief from Oklahoma really started to hit his stride in the Mid-Atlantic area during the month of August. Whether it was in single or tag team competition, Wahoo was looking like a dominating force. 2. Swede Hanson---The big Swede totally dominated his singles matches with Rip Hawk during the month of August. The dominance was so complete, that Rip was running out of the ring and not coming back during many of their encounters. 3. Avenger---The muscular masked man was steadily moving up the ranks during the month of August. The inevitable showdown with the area’s other masked man, the Super Destroyer, was on every fan’s mind. 1. Rip Hawk---“The Profile” pretty much took it on the chin in every singles match he had with Swede Hanson during the month of August. The only saving grace for Hawk is that he remained one-half of the Mid-Atlantic Tag Team Champions during the month. 2. Nelson Royal---Royal was less and less active during the month, and his victories were becoming farther and farther apart. Nelson’s quality of opponents was dipping considerably as well. 3. Bob Bruggers---The former Miami Dolphins footballer continued to have his difficulties during the month of August. Much like Nelson Royal, Bob was sliding further and further down the mid-card ranks. Newspaper clipping courtesy of Mark Eastridge. Ric Flair/ Rip Hawk photo by Bill Janosik.